I haven’t knitted in forever. Life just keeps getting in my way. But then a fickle friend pulled me back into the knitting world, and I figured it was ok as long as I limited myself to only one kind of knitting, so I picked socks. And, since I’ve done a whole one pair of socks in my life, making me a master of the old ways, I decided to work on a whole new way of making socks… with 2 circular needles and magically weird heel turns. So I started on the first practice sock. 17 times. I cast on 2 24 inch needles for this leetle sock and they got all tangled up and confused, so eventually I went down to one needle for a while until I had to go to 2, and it was generally a big old life lesson, wrapped up in a miniscule sock. My daughter asked why I was still working on this doomed socklet and I told her eventually I would finish it. And so I did! I have one leetle sock! 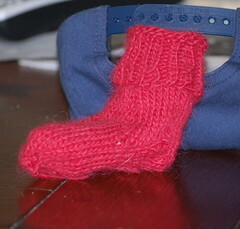 I am so looking forward to making an adult-sized pair of socks! I looked ahead in the book and realized that the socks I most want to make are the toe-up socks, which means I have to make another leetle sock, and I’m not sure I’m up for that yet. So perhaps I’ll pick a leg-down pair to make first. Because focusing all of my knitting energy on socks means I have, um, a *lot* of sock yarn. And some fancy Addis I’m just itching to use.